On the occasion of the 40th issue of the journal Annales monégasques and launch of its website, HSH Prince Albert II of Monaco received on November 4th, in the presence of S.A.R. the Princess of Hanover, members of the editing committee of the Annales monégasques, its authors of the year, as well as group of collaborators and partners who made the success of this official historical journal of the Prince’s Palace of Monaco since 1977. The website will be available online from November 15th. Moreover there will be a paper and PDF versions of the articles accessible to users. 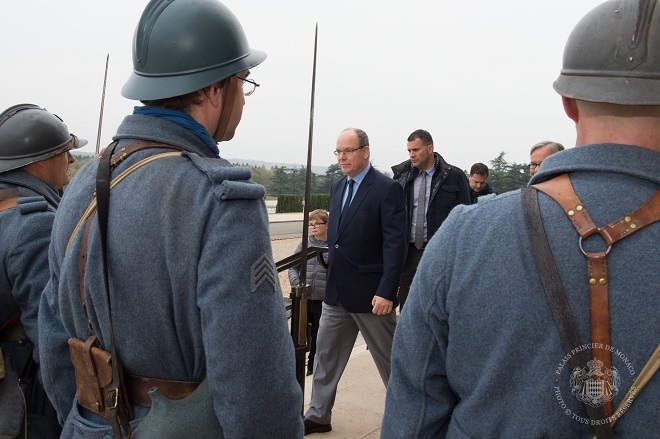 In the honor of the centennial of the battle of Verdun, HSH Prince Albert II of Monaco visited on Friday October 28th, fields of the most violent combats of the First World War. He visited these places in memory of soldiers-volunteers of Monaco among who was also his great-grandfather of, Prince Louis II. Albert II of Monaco was welcomed in the World Centre for Peace in Verdun. Prince also visited the new memorial and the fort of Douaumont. Together with the bishop of Verdun he took a moment at the ossuary which is sculpted with the coat of arms of Principality. The Prince finished this day of remembrance on the Mound of Vauquois, the main place of the mine warfare at the region. The martyred city of Verdun had been rewarded with the Saint-Charles Order by the Prince Louis II in 1929. Monaco Audiovisual Archives on Wednesday November 2 at 18:00 presented the restored version of the movie “Goodbye Bonaparte!” filmed in 1985 by the Egyptian director Youssef Chahine. The projection has been honored by the presence of HSH Prince Albert II of Monaco. In the film story happens in 1798, and concerns the annexation of Egypt by Bonaparte, played by Patrice Chéreau. Accompanied with the general Caffarelli, played by Michel Piccoli, he arrives as the liberator from Turkish oppression in Egypt. Meanwhile, another eco-friendly campaign has been launched in Monaco. 30 bicycles were set next to the Oceanographic museum from November 4th till November 7th. If you try and ride one of them, you will light the Museum building illumination. How great is that?! The main purpose of this action: to show power and possible use of alternative energy sources. This project called “No Finish Lights” aims to raise funds for “Children and Future Fund” which is the organizer of this initiative. “We wanted to illuminate Museum’s facade”, – explains Robert Kalgano, the CEO of the Institute of oceanography and the Museum. – “But we wanted to make it eco-friendly therefore those bulbs are the last generation of lighting technologies and are ergonomic and energy saving”. 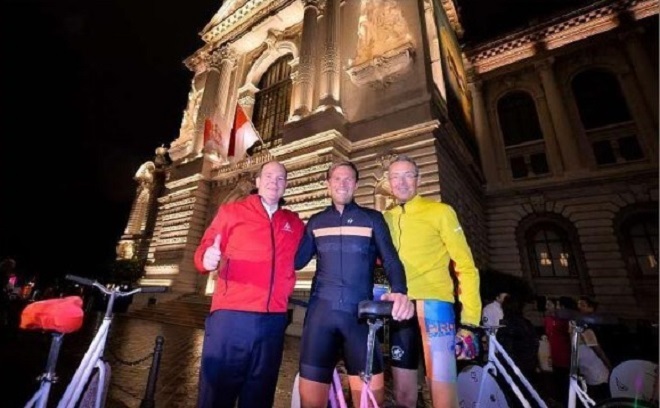 On Friday evening on November 4, HSH Prince Albert II of Monaco together with Thor Hushovd, former professional road bicycle racer and the world champion, as well as with Christopher Steiner, the president of National council, and also with other members of the Monegasque government, visited this installation and rode the bike together with colleagues, illuminating the Oceanographic museum’s facade. However the Prince Albert II is not the only who was in the newspaper headlines of the last week. Rumors about the pregnancy of the wife of Pierre Casiraghi excited journalists for a long time already. And finally it has become known that a new member will join Grimaldi Family of Monaco soon. Beatrice Boromeo and Pierre Casiraghi officially stated that Beatrice will be the mother of their first child early next year. “I am from a big aristocratic family and of course I want to raise my own child”, – assured the press Beatrice Boromeo in one of her latest interviews. The newborn will be the fourth grandson of the Princess Caroline of Hannover, the eldest daughter of Prince Rainier III and Grace Kelly.